The collections in the Hoover Institution Archives provide a record of history both large and small. It is often the exceptional stories of individuals that make larger events come to life. Such human interest stories become doubly intriguing when both the tale and the researching tracking it are remarkable, as exemplified by a research project currently under way in the archives. Edward Anders, a retired astrophysicist living in Burlingame, California, is sponsoring research into a story that is informed by his own life and the circumstances under which he survived the Holocaust in his native Latvia. As a Jewish teenager living in the port city of Liepāja, Anders and his family were in extreme peril when the Nazis invaded Soviet-occupied Latvia in 1941. 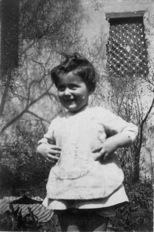 Other members of Anders’s family perished in the Holocaust, but he and his mother survived. This was initially due to the young Anders falsely claiming to the new authorities that his mother was really a German foundling raised by a Latvian Jewish couple. Two Latvian women vouched for this claim, at great risk to themselves. After World War II, and time spent as a refugee in Germany, Anders came to the United States, where he became a noted scientist specializing in the study of meteorites. Since retiring from the University of Chicago, he has been active as an historian, with an emphasis on documenting the fate of Latvian Jews during the war. As part of this effort, he created a searchable database of about 7000 Jewish persons alive in Liepāja in June 1941, with information describing what happened to them subsequently. In October 2000, he took part in the first conference in post-Soviet Latvia on the Holocaust, and he has made important contributions to the work of the Museum of the Occupation of Latvia, located in Rīga. In addition to publishing two volumes of memoirs (a full autobiography From Darkness to Light in 2008 and a condensed 2010 version Amidst Latvians during the Holocaust), Anders arranged for the translation and publication of the diary of another Latvian Holocaust survivor, Kalman Linkimer. In his diary, Linkimer not only wrote about his own experiences in wartime Latvia but also transcribed the accounts of other Latvian Jews hiding from the Nazis. In one of these transcriptions, Riva Zivcon describes how a Latvian policeman, a certain Corporal Avots, helped her and her 3-year-old daughter Adinka escape from the Rīga ghetto. 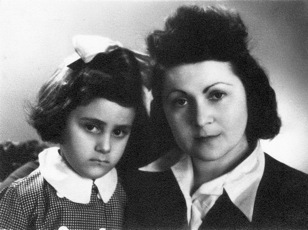 Accompanied by Riva Zivcon and carrying Adinka on his arm, the policeman walked out one of the ghetto gates, brazenly telling the guards he encountered that the mother and daughter were his own wife and child. Former site of one of the Rīga ghetto gates. Avots then took the Zivcons to the home of his girlfriend, telling her that the two were Russians. But when the girlfriend discovered that Adinka spoke only Yiddish, she became fearful of hiding the Zivcons in her place. Avots then took the Zivcons to the home of a prewar acquaintance, a violinist with whom the pair stayed for several weeks before returning to Liepāja, where separate hiding places were found for mother and daughter. Both Zivcons survived the war. Ada Zivcon is now a grandmother living in Israel. Both she and Professor Anders want the various Latvians who saved the Zivcons to be officially recognized as “righteous gentiles” by Yad Vashem, the Holocaust memorial and museum in Jerusalem. So far, Ada Zivcon has succeeded in obtaining this honor for Otilija Šimelpfenigs, who hid her as a child for 16 months. In addition, Professor Anders succeeded in identifying the Latvian violinist as Kārlis Vestens (1899–1978) and in having Vestens recognized for his bravery. However, in the case of Corporal Avots, the question of having recognition bestowed was complicated by the fact that Riva Zivcon did not learn the first name of the policeman who rescued her and her baby, and in the Linkimer diary he is referred to only by his surname. 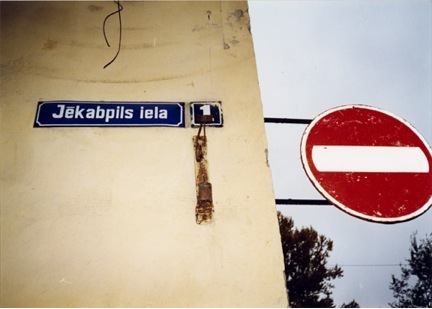 The ghetto guard of which Avots was part consisted of members of the 20th Latvian police battalion and selected members of the Rīga municipal police. No central roster of the ghetto guard has ever been discovered, but the most promising source for information on these police units are records contained in the Latviešu Centrālā Komiteja collection in the Hoover Institution Archives. So far, Meldra Atteka and Una Veilande (Latvian researchers who have volunteered to work for Professor Anders) have found references in this collection to more than one Corporal Avots. Their latest find, which refers to a Corporal Fricis Avots, seems to be the most promising lead, and Professor Anders is optimistic that a solution is at hand to the nearly 75-year-old mystery of the exact identity of the Riga policeman who rescued the Zivcons. The researchers still have about 10 manuscript boxes of documents to go through, and they will continue to look for more documentation relating to the puzzle. Copies of the documents, should they turn out to be ones identifying the right Corporal Avots, will then be submitted to Yad Vashem. If Yad Vashem decides to recognize Avots as a rescuer of Jews, the Latvian government would honor him as well. 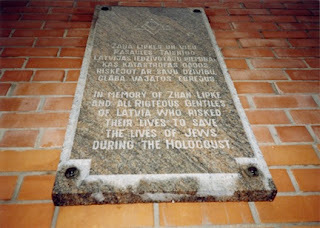 A plaque at the entrance of a street where the Rīga ghetto was once located honors another “righteous gentile,” Zhan Lipke. Plaque in Rīga honoring Zhan Lipke. The Latviešu Centrālā Komiteja collection is the single largest resource on Latvian history in the Hoover Institution Archives. It is very much a composite: a large part of the collection pertains to the life of Latvians in Displaced Persons’ Camps in Germany after World War II; another significant component consists of records relating to Latvian police and military units that were created under the German occupation of Latvia during World War II. The collection also contains demographic data about Latvia under the German occupation, materials relating to nationalist resistance groups in Latvia during the same period, and issuances of the government of independent Latvia before the country’s annexation by the Soviet Union in 1940. The complexity of the situation in Latvia during World War II, and the dual tragedies of Latvian Jews in peril from the Nazis and other Latvians at risk of imprisonment and deportation by Soviet authorities, is captured in a recent documentary film entitled Controversial History (directed by Inara Kolmane and Uldis Neiburgs, Rīga, 2010). Edward Anders figures prominently in this film as one of three individuals who recount their experiences in Latvia during World War II. In the film, Anders revisits Liepāja and the site near that town where the Nazis murdered some 2739 Jews on December 15, 1941. The documentary is in the audiovisual collection of Green Library at Stanford University.